Who Are You Calling Trailer Trash? 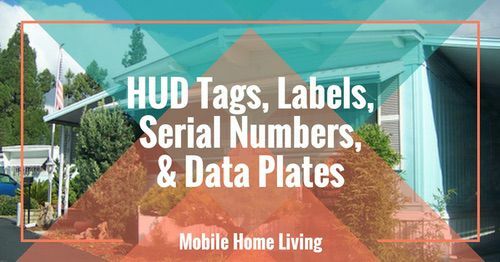 People living in mobile and manufactured homes have been stereotyped, stigmatized, and labeled from the very beginning. In the late 1920’s the first ‘mobile home’ rolled off the assembly line. A transportable canvas tent, pulled behind the vehicle in a small wooden box, had been available for years, In fact, they came out shortly after the automobile. Eventually, a pull-along camper with walls and a roof was available. 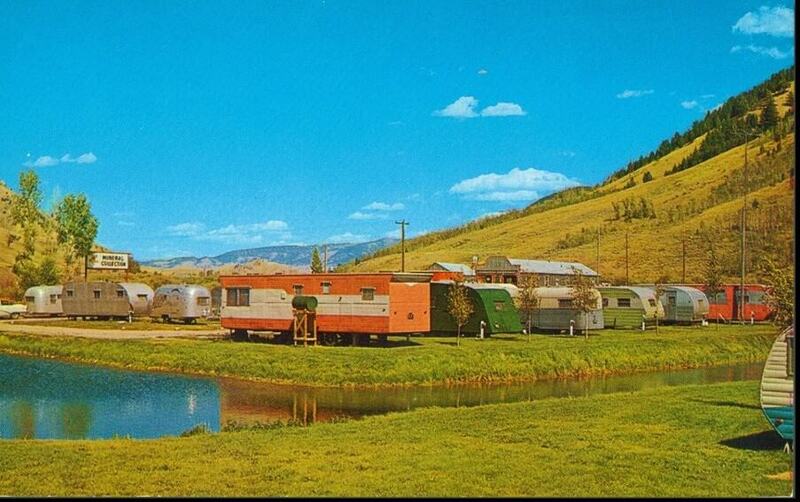 The transformation from the simple camper of the late 1920’s to the gorgeous modern manufactured homes we have today is an almost perfect story of American ingenuity. Americans were suddenly able to see the country and road trips became a popular pastime. It was only natural for the new tourists to want to extend their road trips to see as much as possible. Carrying along cooking tools and sleeping quarters made the trips easier – the public could see as much of the country as they wanted. In the beginning, only middle to high-income families could afford such luxuries as a camper. Campers were a popular status symbol. But WWII changed that quickly. You can read how the mobile home stigma began in WWII here. It’s an interesting story! Stereotyping and name-calling are no longer as tolerated as they once were. You can’t use derogatory words in polite company without consequence anymore. But there is still one group that continues to be labeled freely and openly: trailer trash. It is still acceptable, even in polite company, to use the term trailer trash to describe someone in a negative manner. Just about every other derogatory label has become unaccepted but trailer trash still prevails. Many of us know the truth and understand the advantages of factory-built housing but there are still a lot of good people that are being influenced by the stigma and myths that plague mobile homes. It’s keeping many families from considering a manufactured home. Why is this country so focused on labels? We are told to embrace our individualism and uniqueness but as soon as we do we are labeled rebels, or worse, trash. All of us are supposed to fit into a square peg even though we are all round. Remember the character in the movie “Network” who yelled; “I’m mad as hell and I won’t take it anymore”? That’s exactly how I feel whenever I hear or read two words–”trailer trash.” The supposition seems to be that people who live in trailer parks are trash and/or that their homes are trash; that they are mentally challenged; unclean and have little conception of world events. I have to stop at these quotes because I am getting angrier and angrier. The park where my husband and I live has more than 1,000 homes. The park is well maintained, likewise the homes, with perhaps one or two exceptions. Not a bad ratio, since unkempt homes can be found in any neighborhood. The diversity of the residents is apparent, especially on a warm summer evening. There are young couples just starting out, couples with children, retired couples, widows, widowers, and singles. There is neighborliness, too. After our last bad snowstorm, we soon saw our young neighbor shoveling out not only his car but an elderly neighbor’s as well. There are yearly contests at Christmastime for the best decorated home–also for any homeowner who demonstrates special improvements. There are parties for the children at holiday time. In the summer there are organized softball games and other pastimes, all taken care of by parents and the park management. I would like to point out that communities like ours are no longer called trailer parks. They are “manufactured-home communities.” There is no way one of these homes can be hitched up to a car or small truck and pulled away. Once the home is set up, there it stays. Only extraordinary and costly ways are utilized to pull one out. The homes come in varying sizes and are very affordable compared to site-built homes. Not everyone can afford a $100,000-plus house, after all. In our area (western New York), a new manufactured home can cost $40,000 to $50,000 while a good used one can be bought in the $20,000 to $30,000 range, depending on size. Because of the reasonable costs, these homes make good starters for young couples who hope to move up later to larger, conventional houses. They are suitable for retired people on fixed incomes, families with lower-wage jobs or those who just don’t want the hassle of maintaining a large home. My own experience with so-called trailer parks extends to California where I visited a friend a few years ago. Her park was beautifully laid out and landscaped, as were other parks we toured. The pride of the residents was obvious in the immaculate homes and well-maintained lots. At this point, I admit I am not wearing blinders. No doubt there are trailer parks that are rundown. Unfortunately, the film industry and television insist on perpetuating the stereotyping of trailer parks–manufactured-home communities. In their version, every park is rundown, inhabited by borderline illiterates and drunks prone to violence. The film industry and TV executives along with James Carville, the Newsweek writer and a host of other writers owe an apology to all the residents of manufactured-home communities. We’re sick and tired of the stereotyping……. The above article was originally published in the Chicago Tribune. 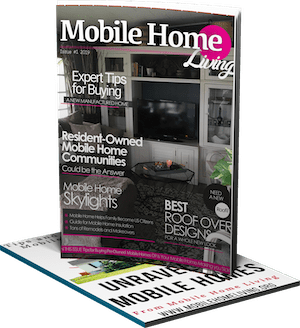 I wrote my own editorial regarding the frustrations I had with mass media and their ever apparent prejudices against mobile and manufactured homes in an article called “Why Mobile home Journalism is Biased” that you may want to check out. I urge all journalists and anyone with a public following to remove the term trailer trash from your vocabulary. It’s indicative of poor research and labeling an entire demographic wrongly and unfairly. We are people simply trying to make it in this world with little debt and lower housing costs. We are far from trash. I’d love to hear your opinion regarding these silly labels and stereotypes and how you think we could best combat them. Just add your comment below. Thanks! I live in a manufactured home and this is my 3rd one I have. I grew up in a sight built home, I bought a sight built home, and I have also live in an apartment. The first mobile home I willingly moved into was tiny and run down. It was not mine so I could not renovate it to my liking or needs. Later I moved into a much nicer mobile home that I had a touch of free will in but my ex husband didn’t want to touch it. We also rented it. He eventually moved us in a even smaller mobile home that was smaller than our first one. We had 2 kids in a cramped 2 bedroom mobile home but we was buying it. Even after the last payment was made he still would not let me update it. Eight years and 1 divorce later I am back in the second home. It is my grandparents but I am free to do any and all improvements I want rent free as long as I live in it. I have never loved a home more. The outside of the homes is still in a slumpy state and it pulls at my heart for my kids when I know others will judge them for the appearance of the outside of the home. The inside has been completely redone with new floors and paint. I have worked hard for this and am debt free because of it. Not many can say this. My funds are now in my kids and myself not a large mortgage I could probably never pay off just to have “that house”. The refurbishing of old manufactured homes is getting the people out of debt our nation has us in. I still think if we took all the old mobile homes, redone them and let homeless live in them would make a huge change in our economy. Give them pride and well rest knowing they can lay their head down out of the weather at night. Even give them better chances of finding work. The potential in manufactured homes is endless. I just wish the judgment on what we do for our families financially would end. We all do what we can with what we are dealt. Thanks for sharing your story! An old mobile home changed my life for the better, too. You know, we were able to give our single wide an exterior makeover with paint for less than $100. It may be an option for your home too. Here’s an article about it. I just found your article, and I thank you for writing it. My husband and I lived in our home for over 22 years until the oilfield bust hit. Our jobs were gone and there were none to be had to make the living we needed. We had to sell our home and move 6 hours away to find work. We worked on cleaning up credit as we got our feet under us, and had money from the sale of our house. It didn’t matter. No broker would touch us because our scores weren’t 620 at the very least (no matter that we’d had 720 scores up until “life happened” ). 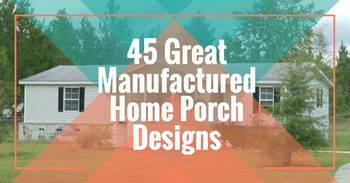 My husband suggested manufactured houses, but I was way skeptical. I had been taught that trailers, mobile homes, etc were bad. I had no idea what they were like, and I was blown away when my husband took me to look. Sheetrock walls with 2×6’s, Textured walls and ceilings and major insulation. They helped us when regular brokers wouldn’t help. They also helped us with the parcel of land we found. So I got a home I loved, and for the first time in my life I got to buy something new, pick my own colors and amenities, etc. We are back on acreage, which we wanted, (we’re suburban at heart), with a home for half the price of any that realtors had shown us and mortgage brokers turned us down for, with more rooms and room (sqr ft) and amenities than any “regular home” we looked at. Plus, this home has weight and stability that will be no different in a storm than any “regular home”. So, call me trailer trash, and I wear that badge proudly because we all have a secret that manufactured home bashers don’t know…we got a better deal than they did, and we are all happily living very happily in our homes. Hey Y’all, I can see some folks getting dissed over the term “Trailer Park Trash” because a lot of those parks are nice places. In fact my Pal Lester lives in one and has a built in pool in his back yard along with a BBQ he can roast a Pig over. But even the best of you “manufactured-home community” boosters have to admit that the term does evoke a certain Kind of place in ones mind deserving of the name. Can’t you just picture this Back woods Arkansas Trailer park with lots of junk washers and dryers, used bathroom appliances, rotted out heaps of old cars, and a Bath tub buried half way in the ground with Mary in it, spread around everyone’s yard? The “Park” is Populated by Pock marked faced Meth freak rednecks who like to target shoot in their back yard with a neighbors trailer 2 doors down range. Many of em have cook houses down in the Holler to make some easy bucks, and once in a while they have a Funeral for some Bubba who blew himself up when he mixed the Phosphorus and the Sodium hydroxide wrong with an open flame nearby. Now THAT is the definition of “Trailer Park Trash” and you upscale park inhabitants should feel as distant apart from such folk as we City home dwellers do. You certainly have a way with words, Hirum! You should be a writer! Speaking of discrimination regarding mobile home parks and the people who live in them, it apparently also exists between those with a double wide over those with a single wide too. I’m not living in a manufactured home yet, but I hope to do so in 2 to 3 years when I retire. I’ve really fallen for a single wide, slightly less than 600 sq foot Palm Harbor home, aptly called, “The Paradise”. Homes Direct of Albany Ore. has pictures. It’s not a cheap looking home inside or out. Can you possibly explain why some Mobile Home Communities refuse to allow new single wide homes, even if they have existing single wide homes in their communities now? I will be locating the home in Washington state. By the time I finish with all the upgrades, both structural and cosmetic, my prospective new home will cost about $60,000, not including foundation, transportation, set-up, and landscaping. I plan to add a one car garage, or at least a car port, depending on what the MHP will accept. I’ve seen this discrimination in leased land parks, co-op parks and parks where you own the land. I just don’t get it. I have the same stupid rules in my town. Thankfully, my property is grandfathered in, meaning if I remove my single wide off the property I have 1 year to put a new one in. If I fail to do it within a year only a double wide will be allowed. Admittedly, single wides do not appreciate as well as double wides (even if they are tied to the land) and a lot of people believe that having a single wide in their neighborhood will lower the real estate prices. I suppose this is a situation where a couple of bad apples ruined the whole barrel and the stereotype and stigma just drew. Hope you the best with your new home. If you don’t mind, please take some photos of the installation. I’m in dire need of some images that show the process. Thank you for reading MHL! 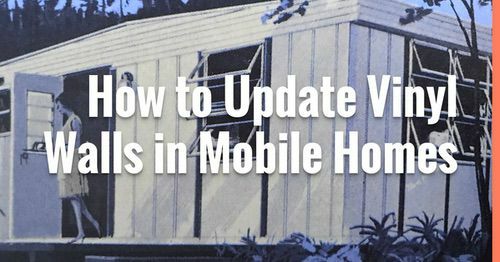 I’m still not sure why even manufactured home owners say “mobile”. My house is not mobile. It’s built with traditional drywall and standard 2×12’s, 2×6’s and 2×4’s. I have screened in porches front and back and sits on a foundation just like any other house. There are no axles or wheels and nothing “less than” about my house. I have a standard mortgage and standard home owners insurance. WHY in this day and age, when people will happily pay $50k for a tiny house not much bigger than my master bedroom, do people look down their nose at me?? Hi, No luck on career yet as I have not adopted the address change thing. I’ve told folks about it, they do agree. I have many addresses to use, but I find it pathetic to use one of theirs. They agree with me. An address should not matter, but it does. Just the other day I was at a grand party. Big Home, it was held at. It’s funny how folks are judged. What happen to morality and good work ethic?????? Foreseen $$$$$$ don’t make people good. It’s actually the opposite, most of them are so far in debt, and they just perpetuate the wealth to live High and mighty with an image!!!!! LOL!!!!!!!! Last year Spring a friend of a friend told me about a mobile home for sale in a nearby town, it was an older, 2 bedroom mobile home manufactured in 1967 (14 X 68, 480 sq.feet) the price was low, $1,500 cash. The mobile home is in a small park with a bad reputation, mainly it was known to be filled with roach infested, dirty homes inhabited by rednecks. 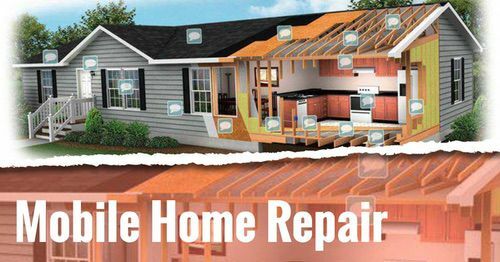 I took a tour of the home and was immediately impressed by the condition it was still in, no roaches or bugs, clean carpets and clean rooms, without hesitation I paid the $1,500 cash. The satisfaction of owning outright your own home is very satisfying, the town I live in is notorious for high rent and utilities, it’s refreshing to know that I only have to pay $170 a month for lot rent plus my utilities. Hi Holly! I love to hear happy stories from other homeowners – thank you so much for sharing! 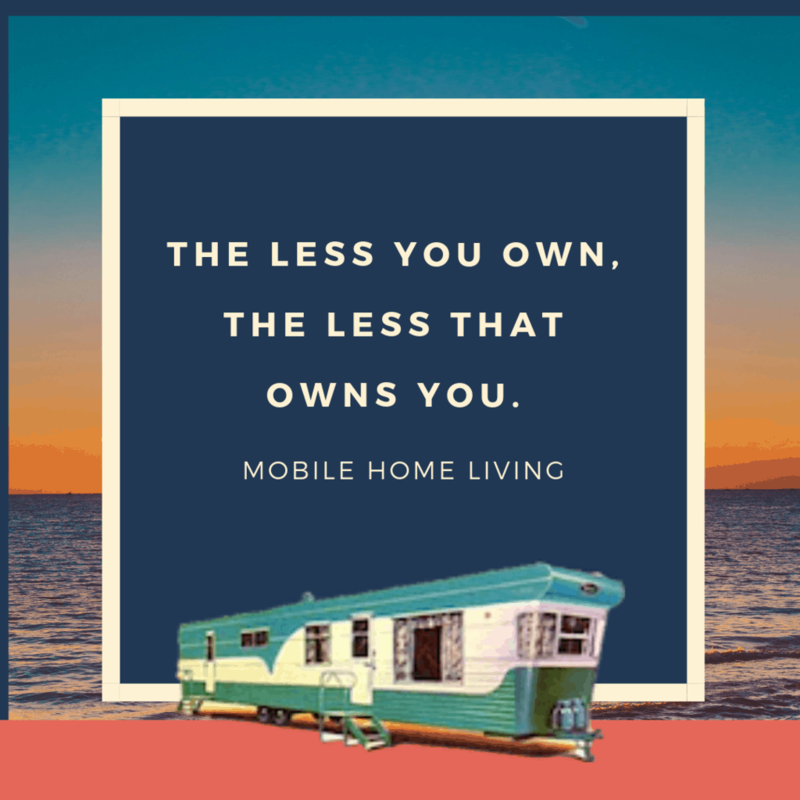 Living in a paid off mobile home completely changed our lives for the better and being able to enjoy life with a little less stress is far more satisfying than keeping up with the Jones! Hope to hear from you lots more! You or someone should do an article on how alot of employers look down on folks who live in manufactured home communities. I finished school for Pharmacy, and not one interview because prospective employers do run addresses on resumes. Via Google. I have seen people do it. It’s as if it is a reverse style of discrimination based on for seen $$$$$$$$$. Hi James! I never even thought about that aspect of discrimination. I’m terribly sorry that you’ve had to deal with this. I hope that we can keep working on educating the public and showing the world that our homes are valid and a smart choice and we’ll eventually stop this idiocy. Hang in there! If you have to, maybe rent a box at one of those office stores or use a friends address just to get your foot in the door. I hate to even suggest that but sometimes we have to stoop as low as others to get a fair and equal advantage.Good luck and keep us posted on the job – I know here in WV pharmacies are begging for well trained employees. Thank you Ms. Adkins for the reply. I’ll keep you all posted. You speak the truth. I’m glad you mentioned the change of address thing. I’ve been thinking about that myself. I’d hate to do that, but what you said is true. Thank you for article. I stumbled upon it after my daughter’s boyfriend stigmatized the mobile home life as being white trash. Well first of all I do not labels. Secondly I had just sold a home for $325,000. and barely came out even as it depreciated. But I was going to be wise and frugal with what money I walked away with and bought some land and am building a small cabin (12’x36″), but needed a place to live. I’ve been renting (almost a year now) a 3 bedroom MH and 2 sheds and almost an acre of land while the cabin is going through phases and inspections. The MH was built in the late 70’s so it’s poorly insulated and a little rough around the edges, but we keep it clean and tidy and it’s home for now. My neighbors are friendly and helpful. Down south in rural Virginia a lot of folks live in MH. My life here on this earth is not to impress others but to be kind and live an honest life. I chose building a small cabin because it’s much less expensive than buying a MH. plus I really just want to keep it simple and have just a one room studio. I think the stigma is weakening seeing that so many people went underwater with the housing crisis and never want to return to that mess again. My friend has a lovely site in a mobile home community right on Smith MTN lake … most of her neighbors are gone for the winter months and they have a beautiful view of the lake from their site. Her’s is bought and paid for and they only pay $125 a month for the 2 acre lot. Not a bad life at all. Hi Allison! It’s great to hear from you! Building a small cabin is a very smart idea and you are absolutely right, you can build one cheaper than you can buy a mh, especially if you’re willing to do some of the labor. You’re also right about the 1970’s mobile homes, insulation wasn’t a big priority for many builders – it was all about quantity and not quality. Only a few companies did the opposite. You are close to my neck of the woods – we’ve been to Smith Mountain Lake many times! It’s only 4 hours away and the area is beautiful! I’ve often thought about relocating there cause I love to be near water and we could probably afford a nice little lake view. Thank you for commenting and I hope to hear from you again. Keep us informed on your cabin! It was nice to come across this site and read other peoples thoughts, experiences and opinions. My husband and I recently purchased a MB, paid cash and were able to put in new flooring, fresh paint,tiled walk in showers new appliances, etc. it’s like a brand new home and we absolutely love the rewarding feeling knowing that we did all the upgrades to our liking and it’s paid for! All we will pay is $340 for our space rent in a gated adult community. We can very well afford to buy a $300k brick and mortar home as our yearly income is $150k but WHY should we? We plan to retire in 3.5 years and the money we would be paying towards a $300k mortgage, we’d rather save and be able to have that available for whatever we choose to do when we pull the plug from working. We are young 45 & 46, will both have 20 plus years of government service and will draw a pension soon but still don’t feel the need to live like 85% of our coworkers who are strapped into a mortgage, new cars, toys and everything else! All of our cars are paid for and we live within our means or truthfully, we’ll below! We did live in a 2000sf home, had an RV, I drove a BMW, my husband had a motorcycle , etc etc but we realized early on that we didn’t want to work longer for the sake having things!! We sold the house, RV, Motorcycle and car and bought a used car paid cash and saved bought this MH. We look forward to saving my monthly income while living off of my husband’s income only, while we work towards retiring at the age of 50! That is a dream we soon get to see become a reality with God’s help and guidance. God has blessed us to be a blessing and we do give freely as he moves us to do so! No trailer trash here just smart people who have come to understand the value of money and that our time is priceless! Not trying to impress people I don’t know! It’s great to hear from you! I love to hear from others that are living debt-free, too. It’s a very stress-free lifestyle. Your story is very inspiring, too! I hope to hear from you more! What a great story of your daughter and your life! I hope my daughter handles any future ‘trailer trash’ issues she may encounter with as much courage and straight forwardness as yours! I’m thrilled to hear that you are in a good park that has good people, too, and that you didn’t get any damage in the flood. Thanks so much for taking the time to comment. I loved reading about your daughter and your life and I hope to hear from you more. Thanks! I too almost missed out on the great opportunity to be a home owner because of the stigma of living in a mobile home. I had lived in a town where “trailer trash” and “trailer park kids” were words used to describe the people living in the local park. I moved from that town (one reason is because I didn’t like how “uppity” it was) and rented a house for a couple of years. When I was told I needed to move because the owners were going to sell the house I wasn’t sure what I was going to do. I’m a single mom of 3. My daughter is out on her own but I still have two teenage boys living at home. I could buy a house, but it would have had to have been pretty small and it certainly would have been a fixer-upper. I didn’t have money to spend fixing up a place nor did I have the time or knowledge to do it myself. I looked at places to rent and I couldn’t find a place that would fit our needs for the amount I could afford. My cousin owns a small mobile home park in the town where I wanted to move and the school district I wanted for my boys to attend. When they suggest I buy a mobile home and put it in his park I was completely against it. No way, I thought! I knew my kids would have an adverse reaction as well, since they knew “trailer park kids” to be “poor children, who come from bad homes.” (This is the stereotype that my old town had.) I continued to look for something to rent, even though I really wanted something that would be mine. My cousins continued to talk to me and after a while I began to see that financially it would be the smartest move for me to buy a new mobile home and make that my home. I finally came to the conclusion that if I really wanted to buy my own place I would be getting a mobile home. That’s when I started reading this great site you have Crystal! Slowly but surly, I began to realize that living in a mobile home could be a great thing. Since it was a new place I wouldn’t initially have to do any fixing of it. It was small enough that it wouldn’t be hard to keep up with. Since I’m single and with kids and work full time, I don’t have a lot of time to spend on maintenance. My cousin does the mowing and snow removal and all that “fun” stuff so I wouldn’t have to do that anymore. When I told my kids we were buying a mobile home, they did, in fact, disagree with me and thought that it was the worst idea ever. However, they finally came around to the idea when I told them they would have their own room and we were going to be getting all new furniture. We’ve lived there for over a year now, and I have to say, I really love it. The size (its a single wide) is perfect. It’s easy to take care of and it’s cozy. It’s a small park so it’s pretty quiet. I’m not paying an arm and a leg for a mortgage, or for utilities. I have money to do some fun things with the kids now and they’re happy about that. They love the school they are in and their friends don’t look down on them at all. Our town is a very small community and everyone knows everyone…good people who don’t judge and I like that! When we first moved there, the boys didn’t want people to know we lived in the park, but now, they have their friends over all the time. Some of their friends live in really big houses and come from money…but they don’t seem to care that we live in a mobile home. Maybe it’s because they see that we aren’t “trash.” ( I absolutely HATE that term!!) For me, it was a great decision that I don’t regret. I do have to admit that I still struggle with the stigma. I mean, the people I work with (I’m a web project manager at a University) know I live in one and they know the reasons I choose to live where I do, but people that I’m friends with on Facebook (mainly people I went to school with) don’t know and to be honest, I don’t want to tell them. Simply because I’m sure some of them would judge me. Should I care? No, I shouldn’t. I guess I still have some growing to do. But, all in all, I do love my little home! It’s a place I go home from a hard day at work and rest. It is homey and it’s mine. If you are considering buying a mobile home, let me tell you, it’s a great way to live. I’ll own my place in 7 years! My kids will be out of the house and it’s all I’ll need. I think it was a very smart choice! Crystal, thanks for what you do. 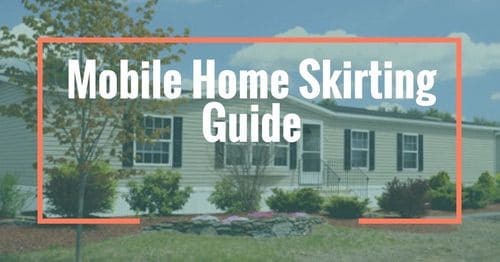 This site helped change my attitude about mobile homes, or manufactured homes, and actually got me excited about my place before I ever even bought it. Jill, I can’t even put into words how much your comment means to me! I’m so glad you are happy and everything is working out for you. Your story and comment have just made my day! Thank you for taking the time to write it! Living in America these days is hard. Jobs are scarce, food and necessities are expensive, taxes don’t ever seem to stop raising and on top of all that, we are expected to be able pay for a 2 story home with 3500 square feet of living space or we are deemed a failure. Our society has gotten everything backwards when it comes to how we judge success! Instead of respecting someone that had the forethought to not buy a home they couldn’t afford we look down on them. I’ll never understand it and completely respect anyone that tries to live differently. I think those that do go against the grain end up a lot happier in the long run, too. You are very smart lady that has the whole world at her fingertips. You tackled something most people can’t and focused on the positive instead of the negative. Thanks again for commenting. I wish you all the success in the world! If you ever need anything, please don’t hesitate to contact me. Oh…thank you Crystal!! Your reply just made my day too. I will stay in touch and comment more often. I would do love if people could grasp that more is not always better. Thanks again for what you do! I had a temporary blindness caused by the stigma you address in this and some of the other articles I’ve enjoyed on your site. A few years ago, my wife and I were looking for an affordable house to buy. It was time to get out of her parents’ basement, which they had offered us rent-free to build up a down payment. But in looking at the online housing listings, I just automatically skipped the mobile homes. Why? They’re drafty, inefficient, shoddily built, etc. etc. The absolute lowest-priced we could find was $125000. Then this mobile home came available in town. My wife showed me the ad. The place didn’t look half bad, so I agreed to go look at it. Now we live in it. It’s a comfortable home which the previous owner had upgraded with extra insulation and new kitchen cabinets. Since finding this site, I’ve thought about my falling into the stigma-trap. Why did I? Why didn’t I remember my grandparent’s house (a single wide that I remember him adding on to double the width)? Or any of a small number of others of friends or family that I had been to that don’t fit that stigma? What was I thinking? Just wanted to add my little story and say thanks for providing this site. Thank you so much Dave for your honesty! It’s a common story, once you get to know the homes, you realize they aren’t as bad as everyone thinks! I’m so glad you shared this. Thank you! Articles. My husband and I are semi retired and downsized from a very expensive up keep home to a Double Wide Manufactured Home. We absolutely love it we are debt free and happy and we love our neighbors. Live in in Wyoming they call it their Cabin ! I to say the least felt offended by her comment. They spent 72,000.00 to build a Glorified Wooden Shed to house a family in cold climate. All I kept thinking was because of their narrow minded thinking and stigma to Manufactured Homes they truly missed the mark on a great home to live in. For that money they could have gotten a huge energy efficient home to live in. I tell everyone I can what a difference this home we live in has allowed us to enjoy a more affordable lifestyle. I wish Society would get it. Living in a Manufactured Mobile Home. Oh, thank you so much for your kind words! I do think the stigma and misunderstanding is keeping a lot of people from realizing the advantages of manufactured homes. They certainly aren’t the trailers they used to be! I’m tickled you are happy and living the lifestyle that you want. It’s a great feeling, huh? Thanks for taking the time to comment! I look forward to hearing from you again. I love to speak with others that have the a similar story. I can learn so much from you and so can others. Thanks again!